Living in residence is an unforgettable experience where you can explore the university’s resources, connect with peers, and forge lifelong friendships. While living on UBC's Okanagan campus, you’ll have the support of staff and participate in planned activities and communal meals designed to help you get to know your neighbours. Hang out with new friends on the rooftop patio of the Purcell Residence, or explore the hiking and bike trails above the upper residences and experience the great outdoors without having to leave campus. Fuel your next adventure with locally grown food and drinks at the sustainably minded Green Thread Market or Sunshine Food Court. UBC’s Okanagan campus residences offer all of the comfort of home, plus all the fun and excitement of university life. The seven residences on UBC’s Okanagan campus, including our brand-new apartment-style buildings at the Cascades (Upper and Lower), are inspiring settings for studying, socializing, and recreation. Your housing options include fully furnished single and double rooms, quad units, studio units, and shared one-bedroom apartments. Single rooms in Valhalla, Kalamalka, Nicola, and Similkameen Place residences include a meal plan. All rooms include internet access. No matter which residence you live in, you will be part of a safe, supportive environment at UBC. UBC’s Residence Life staff will help you navigate your new life on campus and can connect you with resources and supports. Have a question or need some advice? UBC’s Residence Advisors are current students who know the ropes at UBC—and they also can lend an ear when needed. 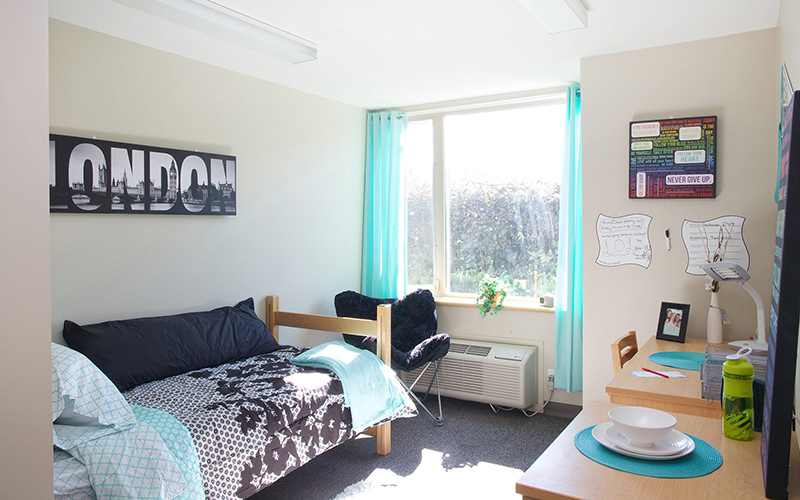 All residences have a front desk where you can access information and resources to make your stay at UBC comfortable. Check back often for news on upcoming Resident events, volunteer opportunities, and fun events like recreational sports, movies, and field trips. Enjoy healthy, sustainable food choices without worrying about cooking, cleaning, or doing dishes! UBC meal plans are designed to accommodate all appetites. Fees vary depending on the size of the plan you choose so the more you plan to eat, the more you pay. Meal plans are mandatory for some UBC Okanagan residences and optional for others. If you’re living in suite-style residences at Lower/Upper Cascades and Monashee Place, you can purchase an optional meal plan for added convenience and savings. At just a short bus ride away from campus, you can access Kelowna’s modern city centre, or venture farther to explore mountain ranges, freshwater lakes, and over 300 hiking trails in the region. All students on UBC’s Okanagan campus receive a U-Pass, or universal transit pass, giving you unlimited access to local transit services, so it’s easy to check out all the city has to offer. Your residence costs will vary depending on what type of room you live in and what size of meal plan you choose. A typical cost for a room and meal plan is between $9,000 and $11,000 for the eight-month school year. Living in residence is an important and meaningful way for new undergraduates—domestic and international—to begin your university journey. That’s why most first-year students are eligible for a guaranteed room in residence through our First-Year Guarantee program. Regardless of whether you are eligible for the First-Year Guarantee, it’s always best to start your residence application as soon as possible. You can start your residence application when you apply to UBC, and then visit the Student Housing and Hospitality Services (SHHS) Online Service Centre to finish your residence application. Or, you can apply for residence directly from the Student Housing and Hospitality Services website, if you didn’t start the process during your application for admission to UBC. Residence is not guaranteed after your first year. Returning students who want to live in residence from September to April must apply before February 1.